The winners of the 2014 Atlantic Book Awards were announced Wednesday night in a ceremony held at the Delta Prince Edward/Prince Edward Island Convention Centre in Charlottetown, PEI. CBC Radio’s Matt Rainnie hosted the sold-out event,with books representing the wide range of literary works being produced in Atlantic Canada—from traditional novels to cutting edge fiction; thought-provoking non-fiction and deeply researched books on Atlantic Canadian history, to poetry; and illustrated children’s picture books to novels written for teens and young adults. Three PEI Book Awards were given out for Non-Fiction, Fiction and Poetry. This marks the first time the event has taken place on PEI. The inaugural Atlantic Book Awards Pioneer Award was given to Bonshaw, PEI resident Harry Baglole for his path-breaking contribution to PEI writing and publishing, including his instrumental role in establishing one of the Island’s first publishing houses, Ragweed Press, in 1973, and his leadership in the development of the Institute of Island Studies and of its publishing arm, Island Studies Press. The Pioneer Award is given as a lifetime achievement award recognizing an individual’s exceptional contribution to the literary arts in Atlantic Canada. 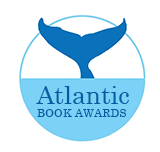 The Atlantic Publishers Marketing Association’s award for Best Atlantic-Published Book recognizes publishing companies and their hardworking professionals who bring out new books each season. Each year, a publisher whose book possesses the best balance of content, presentation, quality of design and production, as well as contributing the most to an understanding of Atlantic Canada, receives the award. The first prize of $5,000 (sponsored by Friesens) is shared between the winning publishing firm ($4,000) and the book’s author ($1,000), with each of the other two short-listed authors receiving $250. The Dartmouth Book Awards were established in 1989 by then mayor of Dartmouth, Dr. John Savage. The annual awards for fiction and non-fiction, valued at $1,500 each, honour the best books published the previous year in celebration of Nova Scotia and its people. The Margaret and John Savage First Book Award, presented for the first time in 2003 with a value of $1,500, recognizes the best first book of fiction or non-fiction published in the previous year by an Atlantic writer. The Award is sponsored by The Savage Family, Collins Barrow and Weed Man. The Prince Edward Island Book Awards are held every two years and are open to authors, editors and book producers resident in the province. In addition to recognizing the quality of publications, the Awards raise the profile of Island books in order to increase sales. The Board of the non-profit Atlantic Book Awards Society (ABAS) is made up of representatives of the Atlantic Canadian book and writing community. The 2014 Atlantic Book Awards and Festival gratefully acknowledges the support of the Canada Council for the Arts, the Canada Book Fund of the Department of Canadian Heritage, the Government of Prince Edward Island and the City of Charlottetown, and the sponsorship of Chapters-Indigo, the Atlantic Publishers Marketing Association, The Chronicle Herald, The Telegram, The Guardian, The Coast, University of Prince Edward Island Robertson Library, Halifax Public Libraries and The Telegraph-Journal.